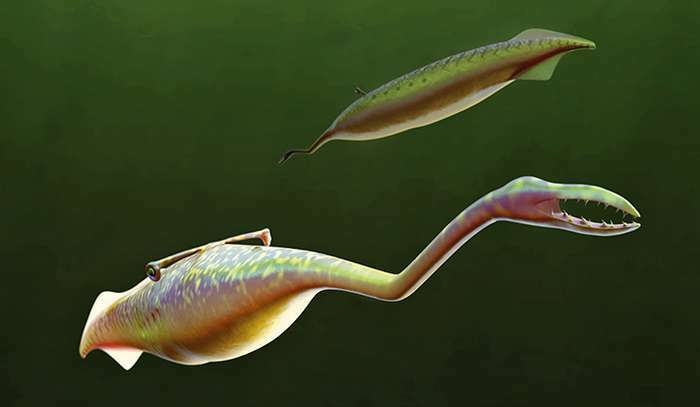 A Yale-led team of paleontologists has determined that the 300-million-year-old animal—which grew to only a foot long—was a vertebrate, with gills and a stiffened rod (or notochord) that supported its body. 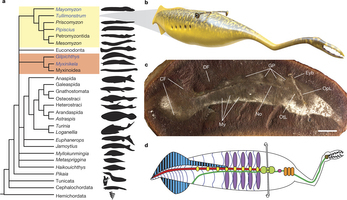 It is part of the same lineage as the modern lamprey. "I was first intrigued by the mystery of the Tully Monster. With all of the exceptional fossils, we had a very clear picture of what it looked like, but no clear picture of what it was," said Victoria McCoy, lead author of a new study in the journal Nature. McCoy conducted her research as a Yale graduate student and is now at the University of Leicester. For decades, the Tully Monster has been one of the great fossil enigmas: It was discovered in 1958, first described scientifically in 1966, yet never definitively identified even to the level of phylum (that is, to one of the major groups of animals). Officially known as Tullimonstrum gregarium, it is named after Francis Tully, the amateur fossil hunter who came across it in coal mining pits in northeastern Illinois. More at the Catalog of Organisms.